Caley Thistle midfielder Joe Chalmers hopes the prospect of winning silverware in their IRN-BRU Cup final against Dumbarton later this month can spark a revival in their Championship form. 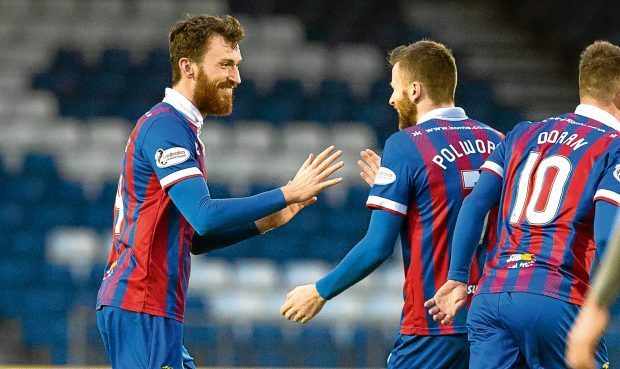 Inverness fell 10 points adrift of the promotion play-offs following Saturday’s 2-0 loss to Morton, which was their only league match in February after Tuesday’s trip to Dumbarton was called off due to a frozen pitch. With 12 league matches remaining, manager John Robertson says Caley Jags must produce something special in order to finish in the top four but with the cup final at McDiarmid Park to look forward to, Chalmers is intent on returning to winning ways in Saturday’s home match against bottom-of-the-table Brechin City. Former Motherwell player Chalmers said: “We can use these cups to help us in the league and build confidence up. A cup win would do massive things for the team’s confidence and team spirit. “It’s something you can always look back on as a team together – nobody can take it away from us if we win a cup. “In my time at Motherwell we never really had any decent cup runs, which makes it more exciting for me. “No matter what cup it is, you play football to play in these games and win trophies. “It’s not just you as a player, it’s a a chance for some of your family to come along and watch you in these big games. You can make a good day of it for them as well. Chalmers says his side’s focus will not shift from league duty, with Saturday’s match the first of four games Inverness must play before their Perth encounter against the Sons. The 24-year-old added: “Every league match is massive now. We had quite a lot of games and then a couple of weeks’ break last month which I don’t think did us any harm. “We now have some massive league games to concentrate on, and they will be getting all of our focus. It will be good to have a wee break from that though, because with the start we made there’s a lot of pressure as we don’t want to fall behind.